As the Dow continues its bumpy ride, many investors are looking for safe investments that will let them sleep at night. Fixed income portfolios can help investors meet their investment goals and avoid the turbulence of today's markets. Managing a Family Fixed Income Portfolio fills a gap in the world of investment literature by providing a serious, analytical understanding of bonds and the bond markets that is accessible to non-specialists. 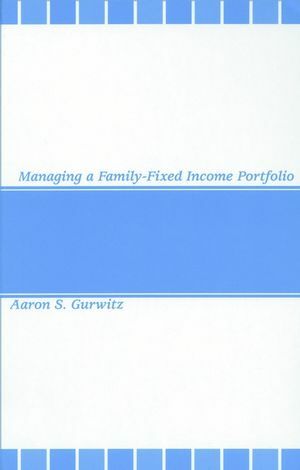 In this exploration of a much-neglected Goldman Sachs Fixed Income Research Strategist Aaron Gurwitz offers a blueprint for mastering fixed income portfolio management for families. The book begins with the basic concepts of bond math, asset allocation, and bond portfolio construction. Discussions of the workings of the global bond market focus on the sectors of most interest to high net worth families, including the U.S. municipal bond market, the eurodollar corporate market, and the global government markets. The final section of the book covers more advanced topics related to the yield curve, interest rate volatility, and fixed-income derivatives. The material will be of interest both to financial professionals who work with wealthy families and to those individual investors who wish to understand this important component of a balanced portfolio. Aaron S. Gurwitz is Fixed Income Research Strategist for Private Wealth Management at Goldman, Sachs, & Co. In that capacity he advises Goldman's high net worth clients regarding investment opportunities and risks in bond markets worldwide. Dr. Gurwitz has been at Goldman Sachs for 12 years serving as Senior Economist, Fixed Income Portfolio Strategist for institutional clients, and Manager of the Firm's Municipal Capital Markets Group. He was twice elected First Team All-American Municipal Portfolio Strategist by Institutional Investor magazine. Before joining Goldman, Dr. Gurwitz held positions as Manager of Domestic Bond Market Research at Salomon Brothers, as Senior Economist at the Federal Reserve Bank of New York and the Rand Corporation, and as Assistant Professor of Economics at Michigan State University. Before attending graduate school, he served for three years as a Peace Corps Volunteer in the Republic of Korea. Dr. Gurwitz holds a bachelor's degree from the State University of New York at Binghamton, masters degrees from Adelphi University and Stanford University, and a Ph.D. in economics from Stanford. He is the husband of Dr. Susan Abramowitz and the father of Beatrice and Zev Gurwitz. 3. The Big Picture: Portfolios, Return, and the Role of Fixed-Income Assets. 4. The Level of Interest Rates and the Shape of the Yield Curve. 5. Interest Rates, Bond Prices, and Portfolio Performance. 6. Currency Exchange Rates and Interest Rates. 7. Choosing the Best Structure for the Family Bond Portfolio. 8. Sectors of the Bond Market: a Global Perspective. 9. Sectors of the Bond Market: A Domestic U.S. Perspective. 10. Credit and Credit Analysis. 11. Operation of the Public Bond Markets. 12. Taxes and the Fixed-Income Portfolio. 13. Managing a Cash Bond Portfolio. 14. Leverage and Short Sales in the Fixed-Income Markets. 15. More About the Yield Curve. 17. Evaluating Bonds with Embedded Options. 19. Putting it All Together: Building and Managing a Private Fixed-Income Portfolio.